A package everyone loves to open. 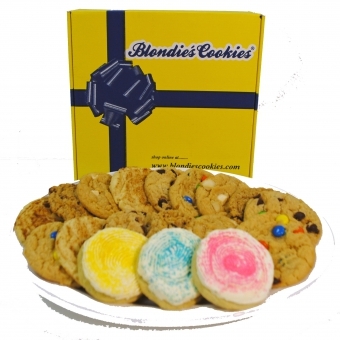 Enjoy a beautiful gift box filled with an assortment of delicious Blondie’s Cookies, Brownies, and Chewies in our elegant gift box or call us at 1-888-298-6820 to create your own custom assortment and choose a gift box for any occasion from a variety of styles, colors, and sizes for a gift that is truly delicious and unique. Our large gift box contains approximately 3 lbs. 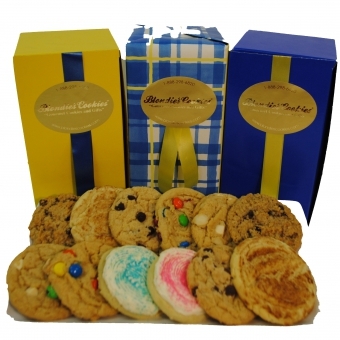 of Blondie’s delicious homemade cookies in our blue ribbon box. Each cookie is individually sealed for freshness. Choose from 1 of 3 options available; assorted cookies, all one variety, or our famous Sprinkles. Assorted contains: 4 Chocolate Chip, 4 Snickerdoodle, 4 White Chocolate Macadamia, 4 M&M®, 4 Oatmeal Raisin, and 4 Sprinkle. 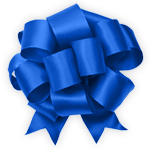 Our medium gift box contains approximately 2 ¼ lbs. of Blondie’s delicious homemade cookies in our blue ribbon box. Each cookie is individually sealed for freshness. Choose from 1 of 3 options available; assorted cookies, all one variety, or our famous Sprinkles. Assorted Contains: 3 Chocolate Chip, 3 Snickerdoodle, 3 White Chocolate Macadamia, 3 M&M®, 3 Oatmeal Raisin, and 3 Sprinkle. Our small gift box contains approximately 1 ½ lbs. 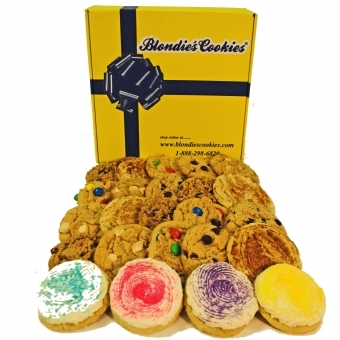 of Blondie’s delicious homemade cookies in a box of your color choice. Each cookie is individually sealed for freshness. 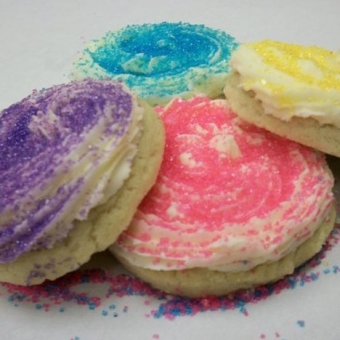 Choose from 1 of 3 options available; assorted cookies, all one variety, or our famous Sprinkles. Assorted Contains: 2 Chocolate Chip, 2 Snickerdoodle, 2 White Chocolate Macadamia, 2 M&M®, 2 Oatmeal Raisin, and 2 Sprinkle. 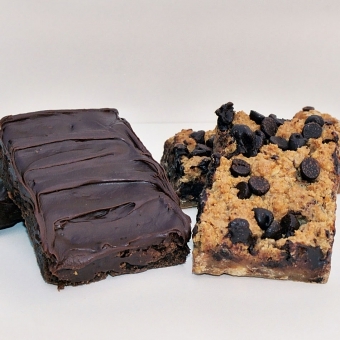 Our brownie and Chewie boxes allow you to choose from all one kind to an assortment. Our 12 ct. assortment will contain 2 each of our double fudge, cheesecake, and German chocolate brownie as well as 2 each of our M&M®, peanut butter, and macadamia Chewies. Our 6 and 9 count assortment will contain our double fudge and cheesecake brownies as well as macadamia Chewies. Our brownies and Chewies are large enough to share weighing in at approximately ¼ lb. each. Our Sprinkle Value Packs offer you our best price per cookie. Whether you have a lot of people to serve, or you are just looking for the best deal, our Value Packs will fit your needs. So, no worries, order all you want, we’ll make more! 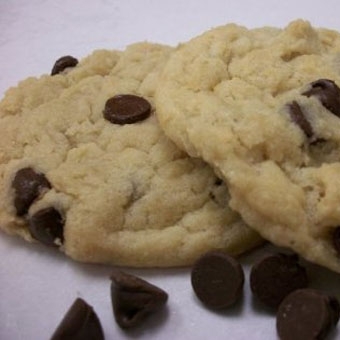 Our Cookie Value Packs offer you our best price per cookie. Whether you have a lot of people to serve, or you are just looking for the best deal, our Value Packs will fit your needs. Go ahead, stock up, we’ll make more!